A 19,000 foot high mountain on the edge of the Yalong canyon in Sichuan, China, Mutikonka is the sacred yak spirit mountain to the local Pumi Tibetans. 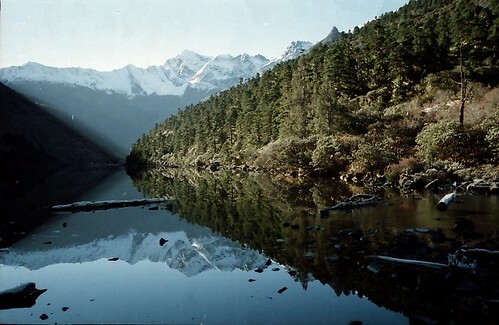 The lake is called ChangHaizi and is reputed to contain a Loch Ness style monster. I sent a copy of this pic to the National Geographic but they weren't interested. So you can enjoy it here instead. dorjelutru, originally uploaded by jiulong. According to Joseph Rock this is a fresco on the wall of the Minya Konka Gompa [Gongga Shan, 贡嘎山] represents Dordjelutru, the mountain god, "who is believed to reside in the highest peak of Minya Konka". thanka, originally uploaded by jiulong. This painting was on the wall at the Minya Konka Gompa [贡嘎寺] when I visited in 1994. I don't know what it is. Any comments? This is the same place as seen below. Compare the two buildings - they are similar but I suspect the lamasery has been rebuilt along the same lines. The old monastery was reportedly destroyed during the Cultural Revolution and rebuilt as seen below in 1980. According to Rock it houses the fresco of the mountain god Dorje Lodro. Altitude 13,300 feet. The head monk at the time can be seen in the black and white picture further down this blog. gongga gompa, originally uploaded by jiulong. This is the Gongga Gompa, the tiny lamasery perched above a glacier at the foot of the 7556m high Minya Konka or Gongga Shan. Absolutely beautiful spot - and with great views of the mountain when it is clear - apparently. According to Joseph Rock it is cut off for about 3 months of the year by snows on the Tsemi La. It can be reached from Kangding in a three day horse trek via Lao Yulin, overnight near Djesi La, the overnight at Yulongxi and via the Tsemi La. Try it! 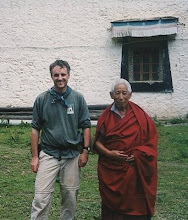 Additional info [added 25/3/2005, from Tibetan Footprint guide by Gyurme Dorje]: The Gonga Gompa is a monastery of the Karma Kagyu school, with 20 monks [although I saw only three or four in residence]. 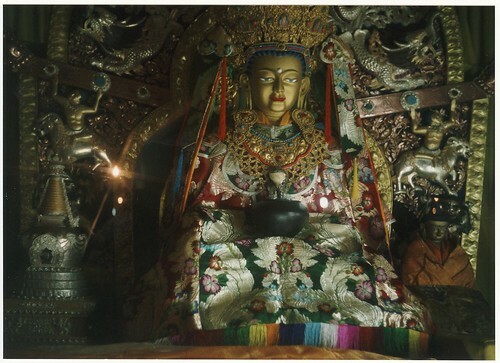 The assembly hall contains images of White Tara, and Marpa flanked by Milarepa and Gampopa, and the present incumbent lama the Sixth Gangkar Rinpoche, who is currently studying in Bir near Dharamsala, India. motherkids, originally uploaded by mutikonka1. This is actually the wife of the ruler of Yongning [永宁], a Mosuo town near Lugu Lake. 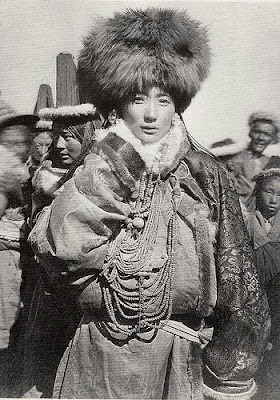 The Mosuo are the now famous minority who practice "open marriages". namu1, originally uploaded by mutikonka1. 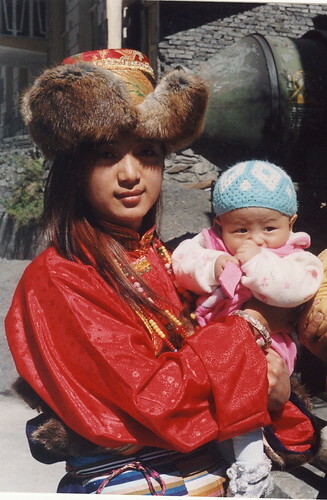 This is the lovely Namu with her baby cousin, in Jiulong [九龙], Sichuan two months ago. 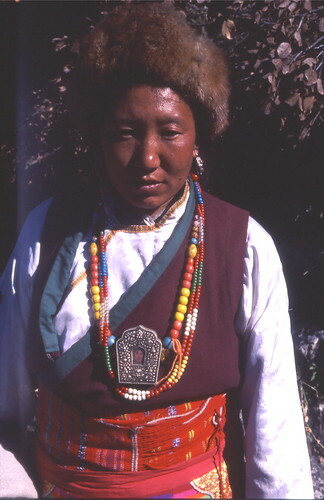 Actually Namu belongs to the Pumi minority, who are closely related to the Tibetans. She doesn't usually dress like this! 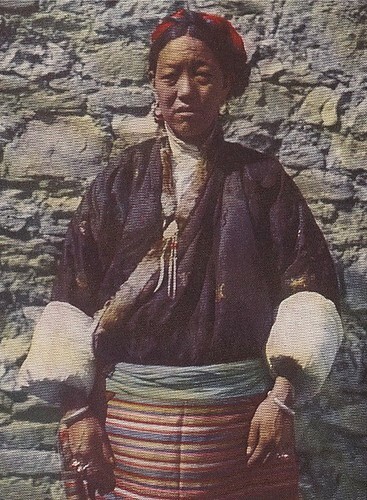 Here is a picture of the man himself, dressed in Tibetan clothing. He is often portrayed as a bad tempered and imperious man, but that is not the impression I have gained from talking to people who have met him. On the contrary, they say he was a dignified, scholarly man who simply preferred his own company to that of others. watchtowers, originally uploaded by mutikonka1. This is a small settlement on the Kangding-Jiulong [康定-九龙] road, with some of the old watchtowers still standing. Compare it with the black and white picture below. watchtowers2, originally uploaded by mutikonka1. This is the Chengzi valley, which runs to the west of Minya Konka (Gongga Shan) between Yulongxi and the Chiprin La (Pass). 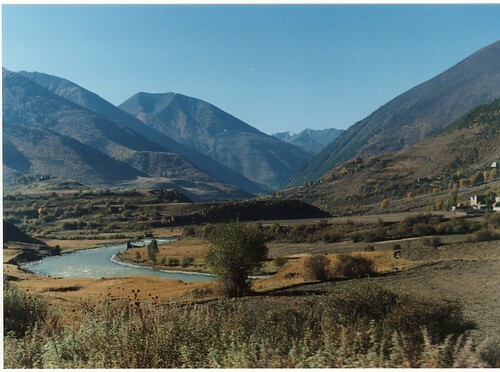 It used to be the main travel route connecting Kangding with Yunnan but has now been supeceded by the Jiulong-Kangding road. Some of the watchtowers are still standing [see above]. renjom, originally uploaded by mutikonka1. 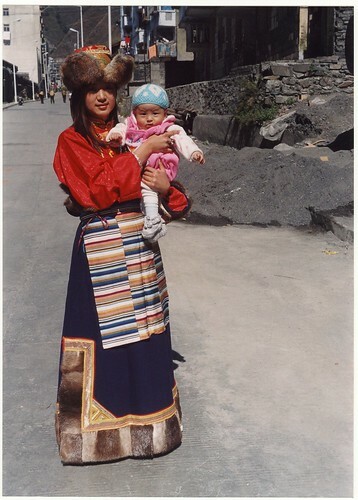 These two very nice Mosuo ladies were at the Renjom Gompa near Yongning [永宁] in 2003, when I passed through on the way to Muli [木里]. The gompa is a tiny monastery just down a gorge along the river from Wujiao [屋脚]. There were two monks there as well. It was a beautiful spot, in an idyllic setting set below the Mount Gibboh pass. Will post some pics later. 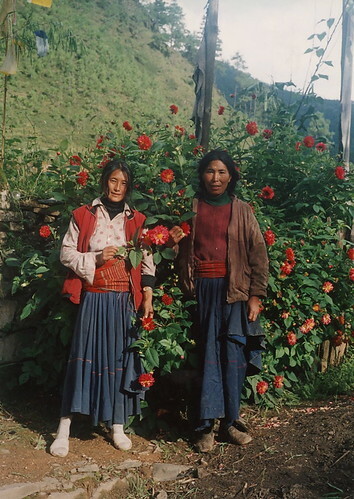 mosuo women, originally uploaded by mutikonka1. 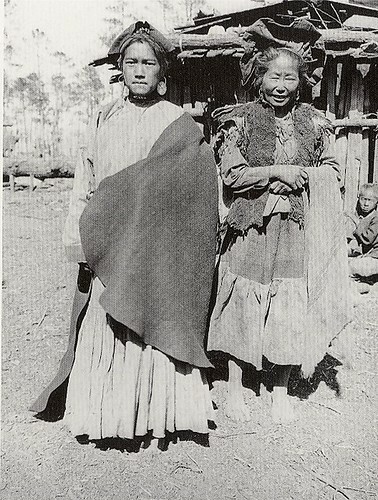 These are "two wealthy Moso women of Yongning" [near Lugu Lake] photographed by Joseph Rock in 1924. 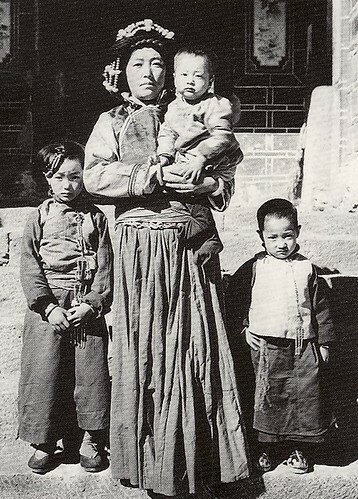 Yi family 1925, originally uploaded by mutikonka1. 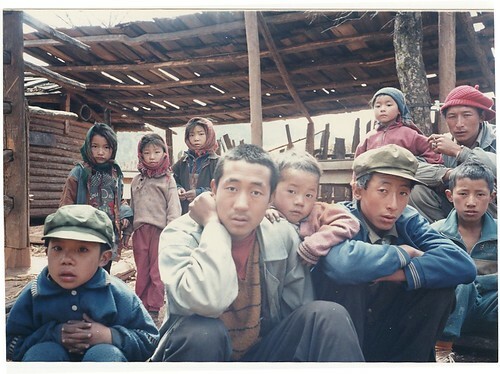 This a group of Yi people (the Nuosuo branch) at a place called Gtoh, "three days north of Lijiang" according to Joseph Rock. wujiao, originally uploaded by mutikonka1. Same century, slightly different dress. 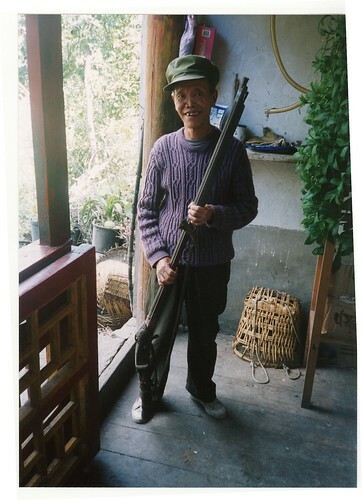 These are some Yi villagers at Lijiasun [利加村], half way between Yongning and Muli [see also the pic of the Yi lady below]. I don't think they'd seen many foreigners passing through, hence the stares. chiburongi, originally uploaded by mutikonka1. Compare this picture to the one below taken 72 years earlier. This is the beautiful sight that awaits you if you walk up the valley from Kangding via Lao Yuling [老榆林] towards the Djesi Pass [加则拉] and Gongga Shan. I must warn you though that it's a day and a bit to get here and you have to overnight in a yak herder's tent. I've no idea how high it is. This is the fork in the trail, where turning right [as we have done here] takes you up over the Djesi pass and down to the Yulongxi [玉龙西] valley and ultimately over the next pass (Tsemi La, 次梅山口) to the Gongga Gompa monastery [贡嘎寺]. Plan B is to take the left route - the notch you can see to the left of the mountain, which takes you on a more direct route to the monastery [serious climbers only]. chiburongi 1929, originally uploaded by mutikonka1. 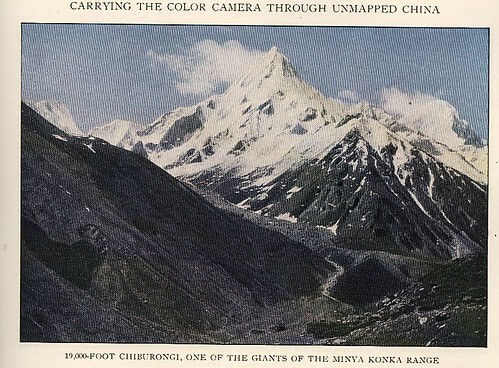 And here is the picture that Joseph Rock took of the same mountain in 1929. Uncanny isn't it - we must have been stood in the same spot. You can read his comments for yourself. namu2, originally uploaded by mutikonka1. This is a bit of a cheat. I put it up to compare fur hats with the pic below. Namu is a very modern Tibetan girl - a med student in Chengdu, and only a nomad as far as her mobile phone will allow her to roam. She got dressed up specially for these pics in Jiulong. 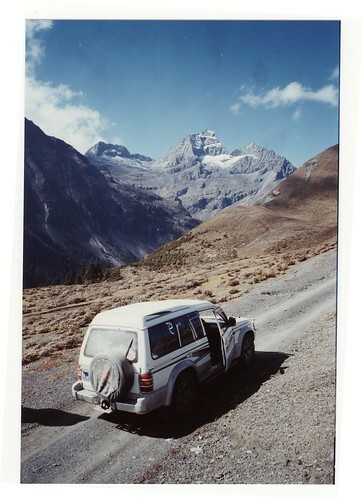 This photo was taken in the Kokonor region - now Qinghai? reliquary2, originally uploaded by mutikonka1. 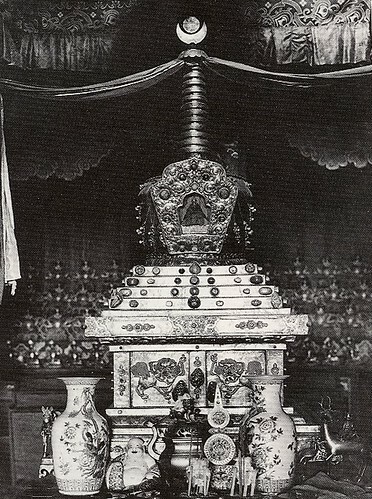 This is the same shrine as that pictured below, now encased in glass. reliquary, originally uploaded by mutikonka1. 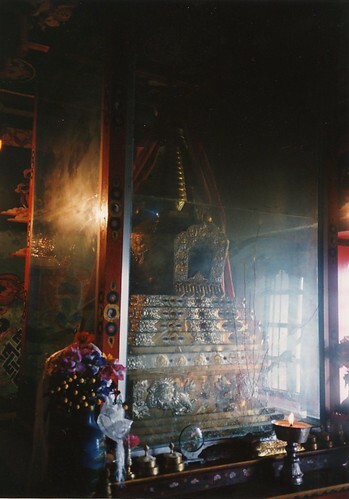 A copper gilt reliquary stupa containing the remains of the former Muli king, at the assemblty hal of Muli monastery. 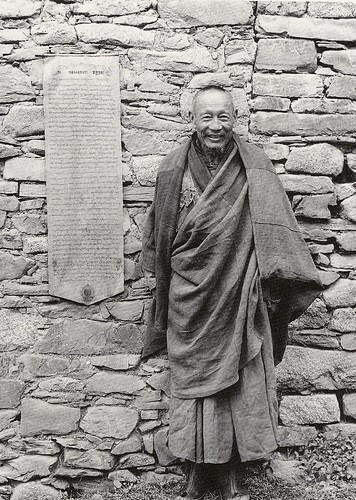 Muli lama, originally uploaded by mutikonka1. 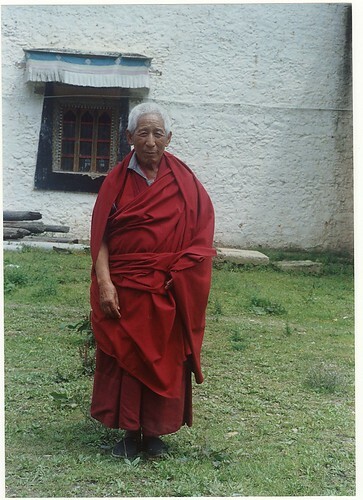 This is one of the senior monks at the now restored Muli monastery, pictured during my visit in 2003.
minyakonka monk, originally uploaded by mutikonka1. This man is the treasury of the small Konka Gompa monastery at the foot of the 7550 metre Minya Konka [now known as Gongga Shan]. Nanwu Si Kangding, originally uploaded by mutikonka1. Compare this photo with the one below. 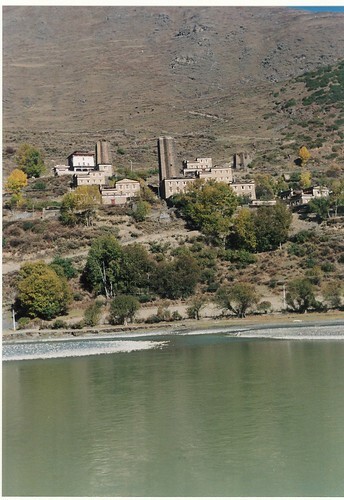 This is the Nanwu Si monastery in Kangding - surely the same as the Dorjedra monastery described by Joseph Rock below. If you look closely you can see it is either the same building with some slight modifications, or an exact replica/rebuild. And while it looks to be set in an idyllic location, this monastery is now set back from a busy road just down from the local Nissan dealership and hidden from view by an ugly and insensitively sited high-rise army barracks. The photograph is taken from the doorway where there is now a backpackers restaurant and hostel called Sally's Cafe. Actually, I think this view is also history because when I looked in during 2004 the whole place was closed for renovation and it looked like this facade had been completely demolished to be made even more grand. 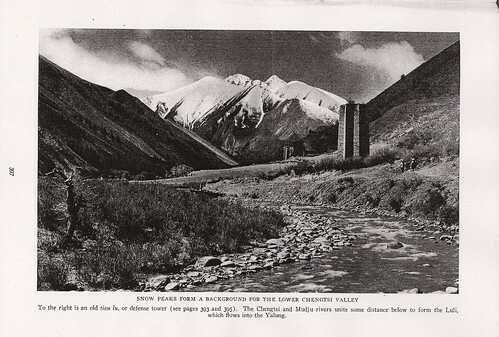 Dorjedra monastery, Kangding 1927, originally uploaded by mutikonka1. 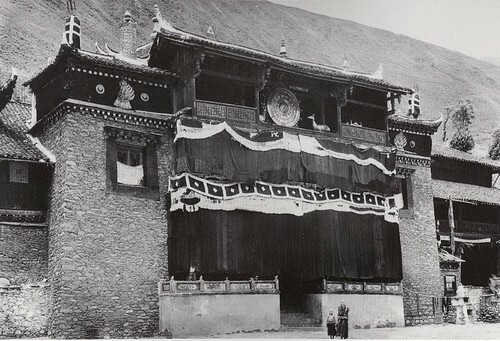 According to Joseph Rock this is the main assembly hall of the Dorjedra monastery in Tachienlu, Kangding. "Built of stone and decorated with great curtains of yak hair" is all he says about it. Jambeyang from Luorong, originally uploaded by mutikonka1. 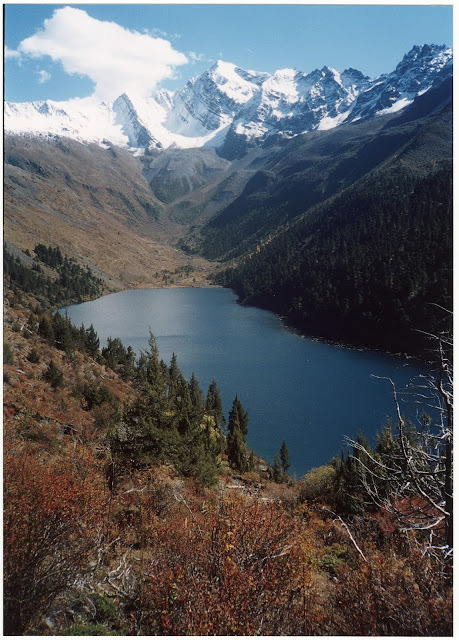 I visited the Yading National Park in Sichuan in spring of 2002. Despite being May we had cold snowy weather - at least the sky was clear! This picture was taken from Luorong pasture, which has now become a popular camping spot for Chinese visitors. For many years people had tried to reach these peaks from Muli, which involved a difficult hike over the Shuiluo rover canyon and over the mountain pass via Garu. Now it's all much easier as the Chinese have built a road in from the north, via Litang and Daocheng. 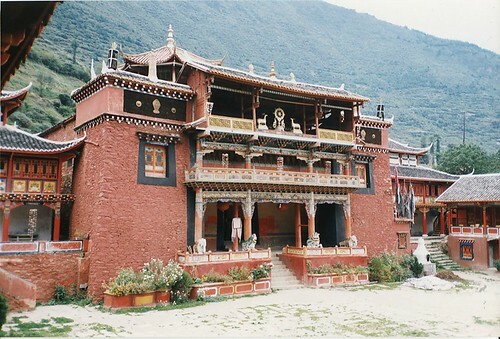 The "bandit monastery" of Chonggu Si, once the shelter for a bunch of violent thieves, is now the visitor centre, with a tent hotel run by their succesors. 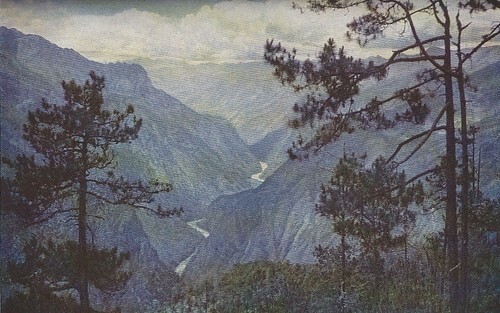 Jambeyang 1928, originally uploaded by mutikonka1. 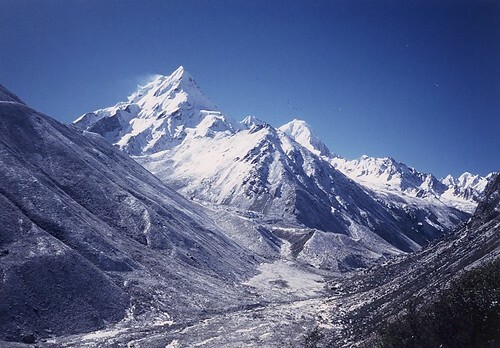 This is one of the three holy peaks of Konkaling - the range known then as Konka Risumgonba. It was visited and circumabulated by Joseph Rock in the late 1920s in the face of opposition from the local bandits. According to Rock, there was a small temple situated at the base of these three peaks, which housed a band of robbers who were also monks! hence his title: "Holy Mountain of the Outlaws". Anyone who ventured within the realm of these forbidden mountains would be robbed shot dead by Trashi and his gang - "the scum of the outlaws" as Rock described them when he came face to face with them on his expedition. Rock survived the enounter because he had sought safe passage from the Muli king, who was the one person these rogues would respect. I will post pictures of the other two mountains - Shenrezig and Chanadorje, when I have time. 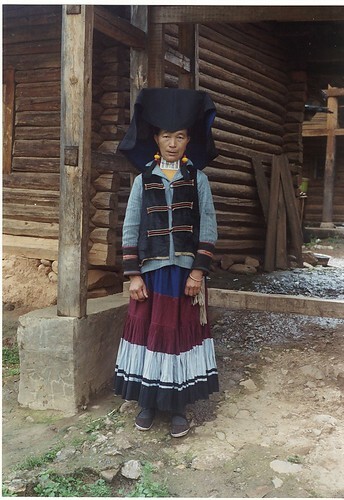 Yi Woman in Wujiao, originally uploaded by mutikonka1. Young Muli monk, originally uploaded by mutikonka1. Muli 1994, originally uploaded by mutikonka1. This picture was taken from the same position as the one below. 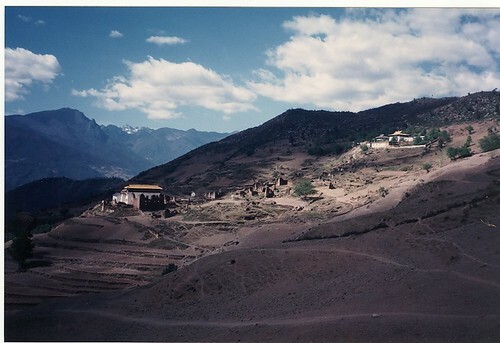 It shows how Muli monastery looked when I paid my first visit there in the spring of 1994. All of the original buildings have been destroyed, and the wall knocked down. The main temple had been rebuilt, as had the head lama's residence that had originally been at the top of the town. Some of the old ruins were still visible at this time. The locals said the monastery town had been knocked down in the 1950s - well before the Cultural Revolution, when the monks resisted communist power. The buidling s were systematically taken apart and used to build a new town across the valley, now called Wachang. The name Muli was also taken and used to describe the county town of Bowa, some 100km further down the Litang valley. 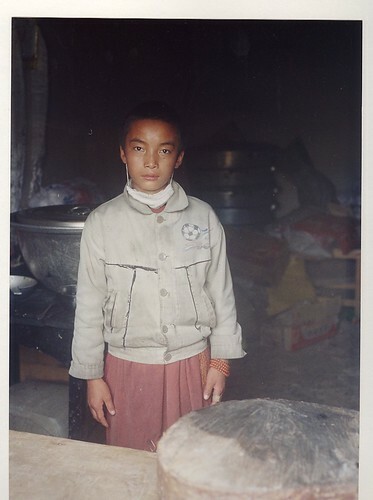 When I visited in 1994, there were about 40 novice monks, mostly local Pumi kids. 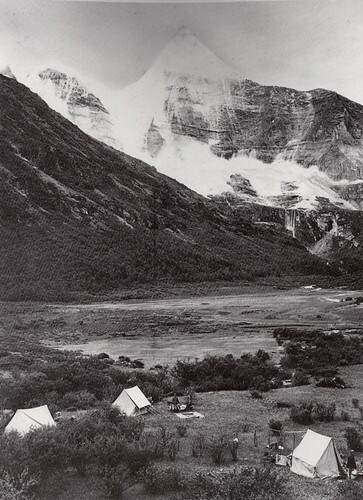 Muli 1925, originally uploaded by mutikonka1. An old flintlock gun, originally uploaded by mutikonka. 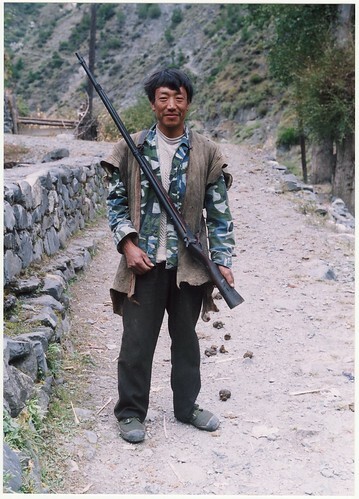 This is Zago Tsering's cousin with an old matchlock rifle from the early 20th century. They were used for hunting and you would need to be a good shot because if you missed it would be at least a couple of minutes before you got the next shot loaded! 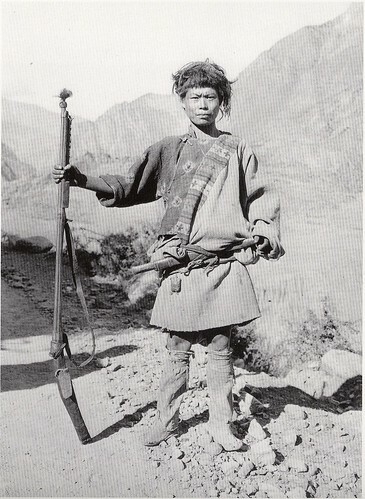 A Naxi man with flintlock rifle, 1927, originally uploaded by mutikonka. 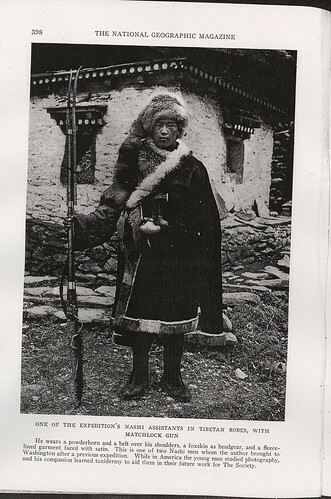 This picture was taken by Joseph Rock in the late 1920s of one of his Naxi personal guards in cermonial dress, with his matchlock rifle. Yongning 1926, originally uploaded by mutikonka. 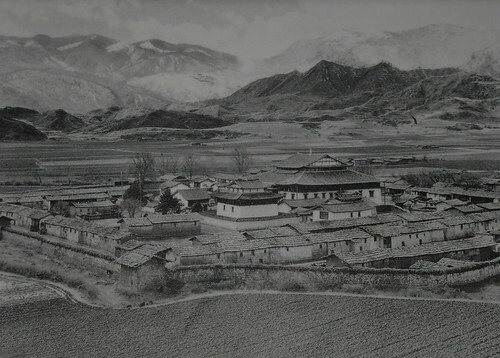 This is Yongning monastery - the Zhamei Si [扎美寺] - in Yunnan province, as seen by Joseph Rock in 1926. He passed through here quite a lot on his way to Muli and became good friends with the Yongning, chief, one of the few Chinese he ever considered "civilised". The monastery is about 20km north of the now popular Lugu Lake and on the outskirts of the small town of the Mosuo market town of Yongning. I like comparing this photograph with the one above. 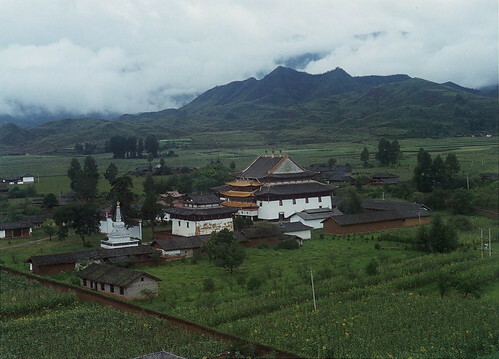 This is Yongning monastery [Zhamei Si, 扎美寺] as it looked on my visit of summer 2003. The main temple has been rebuilt but if you look carefully the smaller building in front is the original. There were very few monks in residence, although the catetakers told me there were usually 30 or so novices. It took me some time to find the spot where Rock had taken his picture from - it was the corner of a hill, just near the road. Kangwo Shan, originally uploaded by mutikonka. A pass of about 4000 metres between Jiulong [九龙]and the Yangwe Kong valley. "We had already been informed at Deon Gomba, a tiny monastery recently looted by the Konkaling bandits, that the Druderon although not high, was snowed in and hence impassable. With an exhausted caravan it seemed hopeless." The following morning when I looked out of my tent and beheld our camp almost buried and our animals shivering in the cold, I really feared for the shelterless men who had stayed behind with the exhausted mules. I also feared for the two of our soldiers who had braved the pass the evening before. 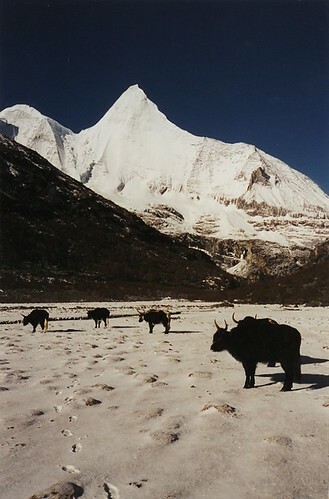 They were to go to [Jiulong] to bring us yaks, which could plough a trail through the deep snow and help us across. The snowstorm continued for a short time; then the sun appeared. This was the last day of April, 1929. In 2004, we were lucky to have clear weather and a car with a good driver. 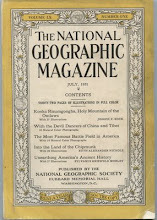 Pilgrim 1929, originally uploaded by mutikonka. This Buddhist pilgrim was photographed by Joseph Rock near Muli, while the man was prostrating his way to Lhasa. Pilgrims 2004, originally uploaded by mutikonka. 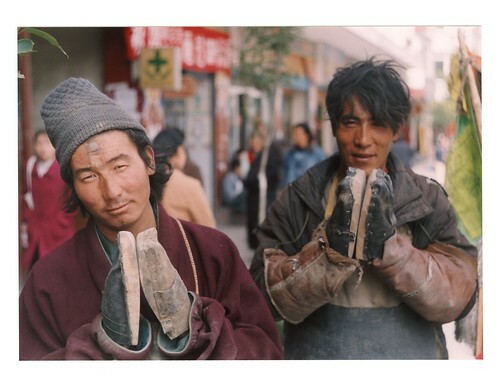 These two Tibetan pilgrims were collecting money on the streets of Kangding in October 2004. 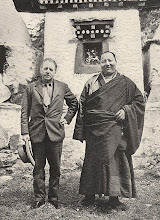 They had made the traditional pilgrimage to Lhasa by prostrating themselves at every step and drawing themselves up again - hence the knee pads and clog gloves. Look for the grey callus on the forehead of the man on the left, the result of him touching his head on the ground (kow-towing) at every step. It usually takes two-thre years to complete this pilgrimage. By the way I gave then 10 kuai! buddha, originally uploaded by mutikonka. Don't know why, I just like this picture. old gun, originally uploaded by mutikonka. 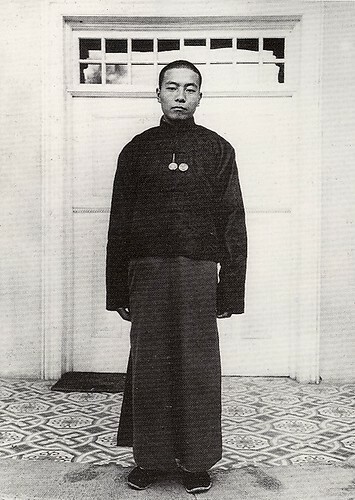 This Pumi man was photographed by Joseph Rock in 1929 by the banks of the Yalong river [雅砻江]. He is using a muzzle loading flintlock rifle - similar to one shown above in a recent picture. 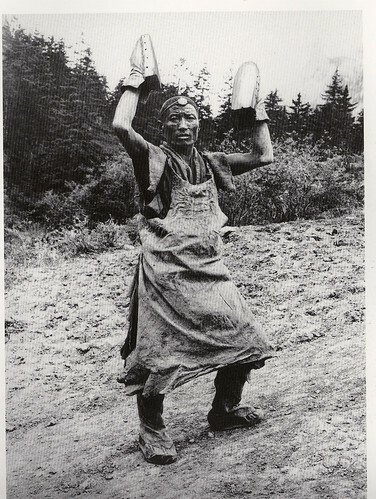 mundon woman, originally uploaded by mutikonka. Namu's great aunt, Nyima. She's actually a lot happier than this when not posing for photos. 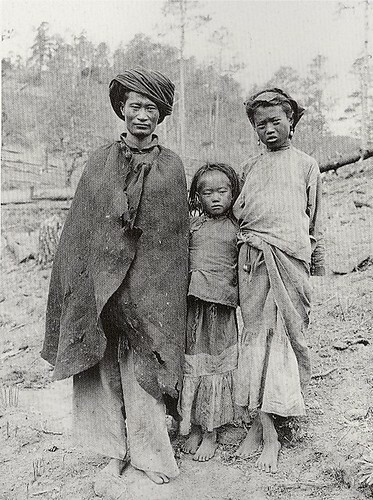 Tibetwomen1, originally uploaded by mutikonka. This colour autochrome photograph was of a Draya woman taken in 1929 by Joseph Rock. Mundon, originally uploaded by mutikonka. 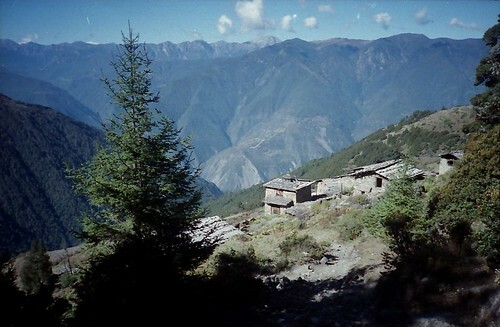 This is Mundon (猛董) village, at about 4500 metres, on the esatern edge of the Yalong canyon. The hills oppoosite are in Muli county. This picture was taken in October 2004, near to where the picture below was taken in 1929.
lake, originally uploaded by mutikonka. This lake is found at the foot of the mountain Maidi Gangga [麦地贡嘎] - or Muti Konka as Rock called it in his October 1930 article in the National Geographic. It is in a Tibetan area of Sichuan province, China. Watch out for the full story later.